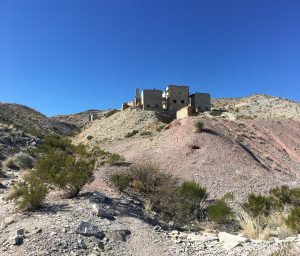 Mariscal Mine / Glenn Springs Backcountry Tour is the most remote day trip we offer. 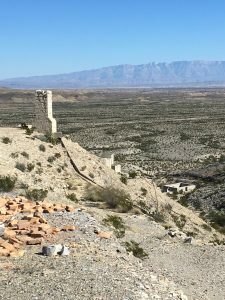 We drive approximately 50 miles on scenic Big Bend back roads to Mariscal Mine, the best preserved of all the old mines in the area, and stop at Glenn Springs, site of an infamous raid by Mexican bandits on May 5, 1916. Meet guests at Marathon accommodations. Take US 385 south 40 miles into Big Bend National Park. Drive 25 miles on paved road and than take River Road East toward Mariscal Mine. River Road is a 53 mile back road-the most remote in the Park. This tour is dependent on dry road conditions-rain can quickly make this route impassable. We avoid operating this trip during the summer rainy season, and will always take a look at the forecast beforehand. The history of the mining era is frozen in these stark structures. How these elaborate industrial fixtures were installed and operated under the most remote and harsh conditions boggles the mind. We take a picnic lunch before or after a walk into the past, with beautiful, 360 degree panoramas. This rugged road carves its way through the foothills of the Chisos Mountains. We take a short stop at an indigenous rock art site on the way back to the main National Park paved road. If time permits, we may stop at Park Headquarter/Visitor center and watch an excellent short video. Originating Marathon, 2-3 guests, $200 per guest. For larger groups, please contact mike@gobigbend.com or call 432 386-5635. 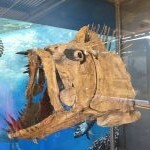 Big Bend Texas Travel is licensed to operate tours by vehicle, on foot, by raft or canoe within Big Bend National Park.